Sacroiliac joint dysfunction generally refers to pain in the sacroiliac joint region that is caused by abnormal motion in the sacroiliac joint, either too much motion or too little motion. It typically results in inflammation of the sacroiliac joint, and can be debilitating. Common symptoms include lower back pain, buttocks pain, sciatic leg pain, groin pain, hip pain (for explanation of leg, groin, and hip pain, see referred pain), urinary frequency, and "transient numbness, prickling, or tingling." Pain can range from dull aching to sharp and stabbing and increases with physical activity. Symptoms also worsen with prolonged or sustained positions (i.e., sitting, standing, lying). Bending forward, stair climbing, hill climbing, and rising from a seated position can also provoke pain. Pain is reported to increase during menstruation in women. People with severe and disabling sacroiliac joint dysfunction can suffer from insomnia and depression. SI joint dysfunction is sometimes referred to as "sacroiliac joint instability" or "sacroiliac joint insufficiency" due to the lack of support the once strong and taut ligaments can no longer sustain. When the joint is hypermobile or loose, it is classified as an extra-articular dysfunction because abnormal joint movement and alignment is a consequence of weakened, injured, or sprained ligaments, while the joint itself is structurally normal and healthy. The sacroiliac joint itself often will not show degenerative changes, such as arthritis, until many years of the dysfunction being allowed to continue. Injury to the ligaments that hold the sacroiliac joints in proper support is thought to be caused by a torsion or high impact injury (such as an automobile accident) or a hard fall, resulting in the hypermobility. As many as 58% of people diagnosed with sacroiliac joint pain had some inciting traumatic injury based on clinical examination findings. The joint that was once stabilized by strong ligaments, now overly stretched, sprained, or torn, will move beyond its normal range. This is thought to result in the ilium and sacral surfaces "locking" in an incongruent or asymmetrical fashion (one innominate bone is tilted anteriorly; the other innominate bone is tilted posteriorly) causing pain that can be debilitating. Hormone imbalances, particularly those associated with pregnancy and the hormone relaxin, can also cause a ligamentous laxity resulting in the weakening of the sacroiliac structure. During pregnancy, relaxin serves as nature's way of allowing the female pelvis to achieve distention of the birthing canal. Pelvic joint pain in post pregnancy women is thought to be derived from the inability of the stretched out ligaments to return to normal tautness. Women who have delivered large babies or who have had extended labors also are prone to developing chronic sacroiliac joint pain and instability. In some people, the sacroiliac joints reverse the normal concave-convex 'locking' relationship, which can lead to rotational misalignment. The variation in joint configuration results in some sacroiliac joints being inherently weaker or more prone to misalignment. Certain biomechanical or muscle length imbalances may ultimately predispose a person to sacroiliac dysfunction and pain. Likely, this is a result of altered gait patterns and repetitive stress to the SI joint and related structures. These conditions exist in persons with leg-length inequality, scoliosis, a history of polio, poor-quality footwear, and hip osteoarthritis. There is also a notable incidence of lumbar spinal fusion patients that present with sacroiliac pain and hypermobility, potentially due to the adjacent lumbar joints being fixed and unable to move. Clinical studies have found up to 75% of post-lumbar fusion patients develop SI joint degeneration within five years of surgery. 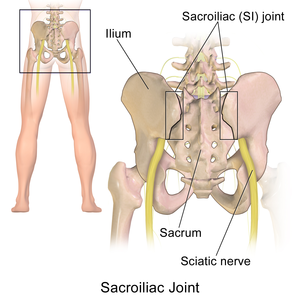 Pathological hypomobility (too little movement) of the sacroiliac joint is an intra-articular disorder in which the joint locks due to wearing down with age or degenerative joint disease. Hypomobility of this kind can also occur with an inflammatory disease such as ankylosing spondylitis,[unreliable medical source?] rheumatoid arthritis, or an infection. The sacroiliac joint is a true diarthrodial joint that joins the sacrum to the pelvis. The sacrum connects on the right and left sides to the ilia (pelvic bones) to form the sacroiliac joints. The pelvic girdle is made up of two innominate bones (the iliac bones) and the sacrum. The innominate bones join in the front of the pelvis to form the pubic symphysis, and at back of the sacrum to form the sacroiliac (SI) joints. Each innominate bone (ilium) joins the femur (thigh bone) to form the hip joint; thus the sacroiliac joint moves with walking and movement of the torso. Muscles and ligaments surround and attach to the SI joint in the front and back, primarily on the ilial or sacral surfaces. These can all be a source of pain and inflammation if the SI joint is dysfunctional. The sacroiliac joint is highly dependent on its strong ligamentous structure for support and stability. The most commonly disrupted and/or torn ligaments are the iliolumbar ligament and the posterior sacroiliac ligament. The ligamentous structures offer resistance to shear and loading. The deep anterior, posterior, and interosseous ligaments resist the load of the sacrum relative to the ilium. More superficial ligaments (e.g., the sacrotuberous ligament) react to dynamic motions (such as straight-leg raising during physical motion). The long dorsal sacroiliac ligament can become stretched in periods of reduced lumbar lordosis (e.g., during pregnancy). Many large and small muscles have relationships with the ligaments of the sacroiliac joint including the piriformis (see “piriformis syndrome”, a condition often related with sacroiliac joint dysfunction), rectus femoris, gluteus maximus and minimus, erector spinae, latissimus dorsi, thoracolumbar fascia, and iliacus. Any of these muscles can be involved or spasm with a painful and dysfunctional sacroiliac joint. The SI joint is a pain-sensitive structure richly innervated by a combination of unmyelinated free nerve endings and the posterior primary rami of spinal segments L2-S3. The wide possibility of innervation may explain why pain originating from the joint can manifest in so many various ways, with different and unique referral patterns (see “referred pain”) for individual patients. Patients with sacroiliac joint dysfunction can also develop tightness and dysfunction in the hamstring, quadriceps, iliotibial tract (see “iliotibial band syndrome”) and hip flexors, including the psoas muscle. Individuals with severe and long-standing sacroiliac joint dysfunction can develop muscle deconditioning and atrophy throughout the body due to limitation of activities and exercise that bring about pain in the low back. Perhaps the biggest reason for misdiagnosis or lack of diagnosis of sacroiliac joint dysfunction is based on the inability of common radiological imaging to discern the disorder. Diagnostic testing, such as X-ray, CT scan, or MRI, do not usually reveal abnormalities; therefore, they cannot reliably be used for diagnosis of sacroiliac joint dysfunction. There is a new definitive imaging test SPECT/CT which can sometimes detect sacroiliac joint dysfunction. There is also a lack of evidence that sacroiliac joint mobility maneuvers (Gillet, Standing flexion test, and Seated Flexion test) detect motion abnormalities. Given the inherent technical limitations of the visible and palpable signs from these sacroiliac joint mobility maneuvers another broad category of clinical signs have been described called provocative maneuvers. These maneuvers are designed to reproduce or increase pain emanating within the sacroiliac joint. Gaenslen test - This pain provocation test applies torsion to the joint. With one hip flexed onto the abdomen, the other leg is allowed to dangle off the edge of the table. Pressure should then be directed downward on the leg in order to achieve hip extension and stress the sacroiliac joint. Iliac Gapping Test - Distraction can be performed to the anterior sacroiliac ligaments by applying pressure to the anterior superior iliac spine. Iliac Compression Test - Apply compression to the joint with the patient lying on his or her side. Pressure is applied downward to the uppermost iliac crest. FABER or Patrick test - To identify if pain may come from the sacroiliac joint during flexion, abduction, and external rotation, the clinician externally rotates the hip while the patient lies supine. Then, downward pressure is applied to the medial knee stressing both the hip and sacroiliac joint. Cautious interpretation is warranted because there are no biomechanical studies showing that the Thigh Thrust test isolates forces in the SIJ when performed at 90 degrees and due to intra-individual variation in body type, hip flexibility, general flexibility of the trunk and pelvis. In all the tests, pain along the typical area raises suspicion for sacroiliac joint dysfunction. However no single test is very reliable in the diagnosis of sacroiliac joint dysfunction. It is important to remember true neurogenic weakness, numbness, or loss of reflex should alert the clinician to consider nerve root pathology. The current "gold standard" for diagnosis of sacroiliac joint dysfunction emanating within the joint is sacroiliac joint injection confirmed under fluoroscopy or CT-guidance using a local anesthetic solution. The diagnosis is confirmed when the patient reports a significant change in relief from pain and the diagnostic injection is performed on 2 separate visits. Published studies have used at least a 75 percent change in relief of pain before a response is considered positive and the sacroiliac joint deemed the source of pain. However, several other injection studies have compared intra-articular with extra-articular injection, and indicate that the ligament injection behind the joint is oftentimes superior to injection in the joint and seems to be a very underutilized diagnostic tool. In the early 1900s, dysfunction of the sacroiliac joint was a common diagnosis associated with low back and sciatic nerve pain. However, research by Danforth and Wilson in 1925 concluded that the sacroiliac joint could not cause sciatic nerve pain because the joint does not have a canal in which the nerves can be entrapped against the joint. The biomechanical relationship between the sacroiliac joint, the piriformis muscle (see “piriformis syndrome”), and the sciatic nerve had not yet been discovered. In 1934, the work of Mixter and Barr shifted all emphasis in research and treatment from the sacroiliac to the herniated intervertebral disc, namely lumbar discs. Medical focus on herniated discs was further forwarded by the invention of the MRI in 1977. Over-diagnosis and attention on herniated discs has led to the SI joint becoming an underappreciated pain generator in an estimated 15% to 25% of patients with axial low back pain. The ligaments in the sacroiliac are among the strongest in the body and are not suspected by many clinicians to be susceptible to spraining or tearing. Skepticism of the existence of sacroiliac joint dysfunction within the medical community is furthered by the debate on how little or much the sacroiliac joint moves. A discrepancy as large as 2-17 degrees has been reported in clinical findings. Treatment is often dependent on the duration and severity of the pain and dysfunction. In the acute phase (first 1–2 weeks) for a mild sprain of the sacroiliac, it is typical for the patient to be prescribed rest, ice/heat, and physical therapy; anti-inflammatory medicine can also be helpful. If the pain does not resolve in the first 1–2 weeks, then the patient may benefit from a steroid and anesthetic mixture fluoroscopically injected into the joint (this also serves in confirming diagnosis), as well as manipulative or manual therapy. For the most severe and chronic forms of sacroiliac dysfunction, treatment should proceed with the support of a sacroiliac belt, injection therapy, and finally, surgery. The anti-inflammatory effect of injection therapy is not permanent, and the injections do not offer an opportunity to stabilize an incompetent joint. Surgery is often considered a last resort, but for some patients, it is the only method of effectively stabilizing the loose joint. A fixation of the joint (screws or similar hardware only, without the use of bone grafting) is more common than a spinal fusion, as it is much less invasive, surgically straightforward, and results in a quicker recovery time for the patient. Some experts in the field believe that it is important to make sure the sacroiliac joint is in an anatomically correct position prior to fixation or fusion, but published research contradicts this belief. ^ a b c d e f g h i j k l m n o p q r s t Sherman, Andrew; Gotlin, Robert; et al. "Sacroiliac Joint Injury". Retrieved 18 January 2011. ^ a b c d e f g h i j k l m n o Sims, Vicki, PT (2004). The Secret Cause of Low Back Pain: How to End Your Suffering. Georgia: sipress. pp. 11–12. ISBN 978-0-9760347-0-4. ^ a b c d e Schwarzer, AC; et al. (Jan 1995). "The sacroiliac joint in chronic low back pain". Spine. 20 (1): 31–37. doi:10.1097/00007632-199501000-00007. PMID 7709277. ^ a b c Gentile, Julie (21 September 2010). "What is Sacroiliac Joint Dysfunction". Retrieved 18 January 2011. ^ a b Kirkaldy-Willis, WH; Bernard, TN Jr (1999). "Making a specific diagnosis". Managing Low Back Pain (4th ed.). Philadelphia: Churchill Livingstone. pp. 206–26. ^ a b Sembrano, Jonathan N.; et al. (2009). "How Often Is Low Back Pain Not Coming From the Back?". Spine. 34 (1): E27–E32. doi:10.1097/BRS.0b013e31818b8882. ^ a b c Bernard, TN Jr; Kirkaldy-Willis, WH (1987). "Recognizing specific characteristics of nonspecific low back pain". Clin Orthop Relat Res (217): 266–280. doi:10.1097/00003086-198704000-00029. ^ a b c d e f g h i j k l m n o p Lippitt, AB (1995). "Percutaneous Fixation of the Sacroiliac Joint". In Vleeming, A. The integrated function of the lumbar spine and sacroiliac joint. et al. Rotterdam: European Conference Organizers. pp. 369–390. ^ a b c d e f g h i j k l m n "Sacroiliac Dysfunction: General Information, Anatomy, and Treatment". Retrieved January 18, 2011. ^ Isaac, Zacharia; Devine, Jennifer. "Sacroiliac Joint Dysfunction". In Frontera, WR. Essentials of Physical Medicine and Rehabilitation: Musculoskeletal Disorders, Pain and Rehabilitation. Saunders/Elsevier. ISBN 978-1-4160-4007-1. ^ a b c d Heller, M (2006). "Sacroliliac Instability: An Overview". Dynamic Chiropractic. 24 (21). ^ a b c MacLennan, AH; MacLenna, SC (1997). "Symptom-giving Pelvic Girdle Relaxation of Pregnancy, Postnatal Pelvic Joint Syndrome and Developmental Dysplasia of Hip". Acta Obstet Gynecol Scand. 76 (8): 760–764. doi:10.3109/00016349709024343. ^ Ha; et al. "Degeneration of Sacroiliac Joint After Instrumented Lumbar or Lumbosacral Fusion: A Prospective Cohort Study Over Five-Years Follow-Up". Spine. 33 (11): 1192–1198. doi:10.1097/brs.0b013e318170fd35. ^ Jee, Won-Hee; et al. (2004). "Sacroiliitis in patients with ankylosing spondylitis: association of MR findings with disease activity". Magnetic Resonance Imaging. Elsevier. 22 (2): 245–250. doi:10.1016/j.mri.2003.09.002. ^ a b Foley, BS; Buschbacher, RM (2006). "Sacroiliac joint pain: anatomy, biomechanics, diagnosis, and treatment". Am J Phys Med Rehabil. 85 (12): 997–1006. doi:10.1097/01.phm.0000247633.68694.c1. ^ Frieberg, AH; Vinke, TH. "Sciatica and the sacroiliac joint". Clin Orthop Relat Res. 1974 (16): 126–34. ^ a b c d e f g Richard Don Tigney. "The Sacroiliac Joint". Retrieved January 18, 2011. ^ a b Hungerford, Barbara; Gilleard, Wendy; Hodges, Paul (2003). "Evidence of Altered Lumbopelvic Muscle Recruitment in the Presence of Sacroiliac Joint Pain". Spine. 28 (14): 1593–1600. doi:10.1097/00007632-200307150-00022. ISSN 0362-2436. ^ Hesch, Jerry (2011). Sacral Torsion in Dalton E. Dynamic Body. Oklahoma City, OK: Freedom From Pain. pp. 206–7. ISBN 978-0-615-27939-8. ^ a b Borowsky CD, Fagen G (2008). "Sources of sacroiliac region pain: insights gained from a study comparing standard intra-articular injection with a technique combining intra- and peri-articular injection". Arch Phys Med Rehabil. 89 (11): 2048–56. doi:10.1016/j.apmr.2008.06.006. ^ Schwarzer AC, April CN, Bogduk N (1995). "The sacroiliac joint in chronic low back pain". Spine. 20: 31–37. doi:10.1097/00007632-199501000-00007. PMID 7709277. ^ Maigne JY, Boulahdour H, Chatellier G (1998). "Value of quantitative radionucleotide bone scanning in the diagnosis of sacroiliac joint syndrome in 32 patients with low back pain". Eur Spine J. 7: 328–331. doi:10.1007/s005860050083. PMC 3611275. PMID 9765042. ^ MurakamiE Tanaka Y, Aizwa T, et al. (2007). "Effect of peri-articular and intra-articular lidocaine injections for sacroiliac joint pain: prospective comparative study". J Ortoped Science. 12: 274–280. ^ Danforth, M; Wilson, P (1925). "THE Anatomy Of The Lumbo-Sacral Region in Relation To Sciatic Pain". J Bone Joint Surg Am (7): 109. ^ Mixter, WJ; Barr, JS (1934). "Rupture of the Intervertebral Disc with Involvement of the Spinal Canal". N Engl J Med. 211: 210–5. doi:10.1056/nejm193408022110506. ^ "MRI's inside story". Economist. 4 December 2003. Retrieved May 23, 2011. ^ Smidt, GL; et al. (1995). "Sacroiliac kinematics for reciprocal straddle positions". Spine. 20 (9): 1047–1054. doi:10.1097/00007632-199505000-00011. PMID 7631234. ^ Smidt, GL; et al. (1997). "Sacroiliac motion for extreme hip positions: A fresh cadaver study". Spine. 22 (18): 2073–2082. doi:10.1097/00007632-199709150-00003. PMID 9322317. ^ Sturesson; et al. (2000). "A radiostereometric analysis of movements of the sacroiliac joints during the standing hip flexion test". Spine. 25 (3): 364–368. doi:10.1097/00007632-200002010-00018. PMID 10703111. ^ Zelle Boris A; et al. (2005). "Sacroiliac joint dysfunction: evaluation and management". The Clinical Journal of Pain. 21 (5): 446–455. doi:10.1097/01.ajp.0000131413.07468.8e. ^ Tullberg T; et al. (1998). "Manipulation does not alter the position of the sacroiliac joint. A roentgen stereophotogrammetric analysis". Spine. 23 (10): 1124–1128. doi:10.1097/00007632-199805150-00010. PMID 9615363. ^ Walker J M (1992). "The sacroiliac joint: a critical review". Physical Therapy. 72 (12): 903–916. This page was last edited on 15 October 2018, at 14:11 (UTC).